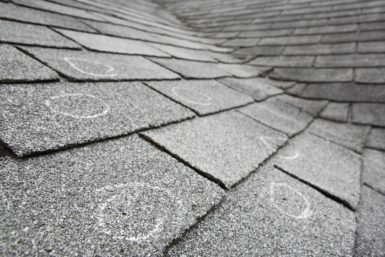 Hail damage is one of the most common reasons why roof repairs are needed in the Greater St. Louis, Missouri area. Frequent storms can wreak havoc on all types of roofs, so it’s important to choose a roofing contractor that has a reputation for providing quality work and is experienced with the insurance claims process. With more than 40 years of experience, Daech & Bauer Roofing has helped thousands of customers in the area return their roofs to optimal condition following hail damage. Our passion for our work shows in the quality of service we provide throughout the St. Louis, MO area, and our focus on craftsmanship helped us to be named a Top 100 Roofing Contractor in the U.S. by Roofing Contractor magazine. Additionally, our roofing technicians have the ability to repair all types of residential roofing, including energy-efficient shingles, cedar shakes, tile, slate, and more. If the roof on your home has suffered hail damage and you are looking for a residential roofing company you can rely on, contact Daech & Bauer Roofing today. We proudly serve the Greater St. Louis, MO area and the entire Metro East region.